← Should you Worship Christ, or Worship Yahweh? The 144,000 are the number of holy ghost Orders that make up the faithful humans that have passed and then crossed over to serve in the holy family. If only 144,000 were saved, that would nullify the necessity of the message of salvation to the masses that number in the millions. 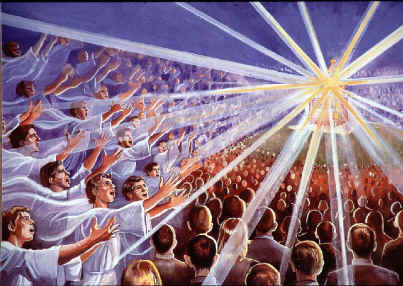 The mystery of the holy ghost Orders is revealed within the Word. When searching for a key that unlocks a mystery, note that Yahweh referred to the nation of Israel as an individual. In likeness, She referred to the holy Ghost Orders as individual’s. We know from the Word that Israel was Yahweh’s chosen people in that day and time. They were the reflection of what would become the Spiritual Israelites. Yahweh is ISRAEL and is LIGHT = Israelite. Understand? And so, the 144,000 are also spoken of as individuals, but are really a people making up the vast amount of Orders of holy ghosts serving Yahweh and Christ in the holy family. Since Christ was Michael in his beginning, and Spiritual Israel rests upon his foundation – life sustaining blood Sacrifice, Yahweh was also correct in stating that Israel represented Her first born Son. To know that Christ and Michael are the same, you need only unlock the mystery with the key of “firstborn.” Michael was the firstborn creation of Yahweh, and the only direct creation. That in itself solves the mystery of whom Christ really was before coming to the earth to lay down his life and permit his blood to become the waters of life that flow back to Yahweh. Here is the secret of the mystery. Every tribe represents Orders, and 144,000 represents individual Orders and not individual people. Each Order descended from the tribes of Israel and are named after 144,000 faithful servants of Yahweh from ancient Biblical time. As people pass over to the other side, they are given the opportunity to hear the Truth and then cross over to Christ and Yahweh’s side of the spiritual war. The excepts are criminals and evil doers that are punished. If a person refuses the invitation, they are converted to Satan’s side. But those that cross on over become members of one of the 144,000 Orders of holy ghosts. And not only that of Christ, but all mysteries of the Word. “Souls under the Altar” defines that they are already saved and in Yahweh’s protection by their status. When I say “saved,” I mean under oath to keep Yahweh’s Laws and to serve Her throne as Christ being their HEAD, and thereby under Yahweh’s protection and in no need of further deliverance from Satan’s prison of Magog. With the Word, one must use their insight to understand the meanings that put there in riddles. or meaning. 2 a puzzling person or… thing. >verb archaic speak in or pose riddles. This entry was posted in Holy Ghosts and tagged 144000, Holy Ghost Orders, Holy Ghosts, The 144000. Bookmark the permalink.